The Easter long weekend has set in and while we all sit back, relax and snack on delicious chocolate eggs, it’s important to not become lax when it comes to the diet of our pets. 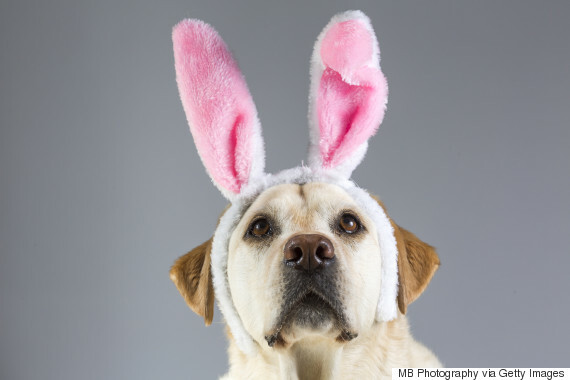 Vets are warning pet owners not to offer their dogs or cats any eggs this Easter and are also reminding them to lock pets away from the yard if they plan on having Easter egg hunts. Theobromine, a substance found in the cacao seeds that are used to make chocolate, is not only deadly to dogs in heavy doses but can also have an adverse impact on canine health according to Dr Leonie Richards, head of General Practice at the University of Melbourne’s Werribee U-Vet Animal Hospital. “Dogs don’t metabolise it properly,” she told The Huffington Post Australia. “In lower doses it will cause gastro-intestinal upsets, vomiting and diarrhoea [but] it can go further and cause neurological problems." Theobromine also poses the same threat to cats, however Richards believes that they are not as attracted to eating the chocolate as dogs are. “They [cats] are more likely to play with a small egg and swallow it whole and then they have an obstruction,” she said. However, it’s not only chocolate that pet owners need to be worried about. Richards warns that as families sit down for lunch over the weekend, they must also make sure their pets aren't thrown any onions, grapes or fatty meat offcuts from the table -- no matter how desperate they look. “Anything in the onion family -- that would include high quantities of garlic as well -- they've got a chemical in it that dogs don’t digest properly and it affects their red blood cells,” she said. “Grapes -- it’s not dose related, it’s individual related -- they are not sure of the entire mechanism [but] it can only require one grape to kill a dog. As for felines, Richards said that people should make sure that their cats don’t have any access to lilies which may be found in bouquets brought by visitors over the long weekend. “Lilies are really toxic for cats [and they] are prone to chewing lilies and it causes acute renal failure,” she said. Richards advises that if you suspect your pet has eaten something it shouldn't have, you should call a local animal emergency centre. “There are charts to work out whether the owner should be concerned or not,” she said. “If the dog is starting to show symptoms or it is deemed they have eaten too much, I would probably take them to an emergency centre rather than use a home treatment. According to the RSPCA, other festive foods that should be avoided include avocado, coffee, fruitcake, macadamia nuts, pork and ham. 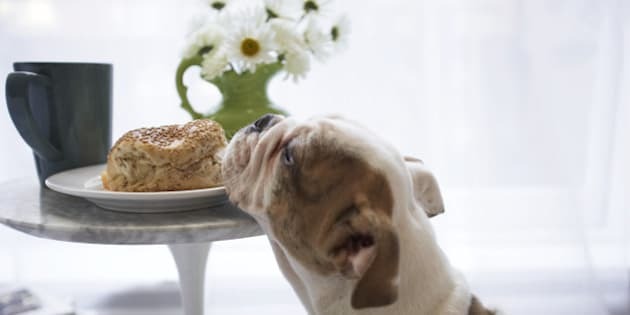 “Pet owners could find themselves spending Easter at a veterinary emergency hospital if their animal overindulges in festive foods,” Dr Christina Zhu, RSPCA NSW Chief Veterinarian said. However, it’s not all doom and gloom. Richards advises that it’s perfectly safe to feed our pets most vegetables, such as roasted pumpkin and potato, broccoli and carrot. So feel free to give these to the dog so you can save room for the good chocolate you've been hiding from your guests.